"It's more difficult," said the renowned English tuner Colin Seeley, "to build a road-going bike than a racing machine." Nevertheless, that's what he did when he created his masterpiece, the Condor, a Grand Prix motorcycle adapted for road use. There were minor differences between the Condor and the Grand Prix Seeley. It had one intake valve fewer, a lower compression ratio, an Amal Concentric carburettor replacing the GP unit of the same diameter, an AMC gearbox and an alternator added below the primary transmission. The ingenious straight-tube girder frame, with the engine suspended from it, remained unchanged. With an extraordinary power to weight ratio, the Condor was an explosive mixture of fabulous highway qualities. Side-car champion in 1962-63 with an outfit powered by a Matchless G50 engine, ColinvSeeley was enamored of this excellent engine. This overhead camshaft engine had gained its highest racing honors in its 350cc AJS version, the 7R. The production of AJS 7R and Matchless G50 ceased in 1962, when taken over by A.MC. 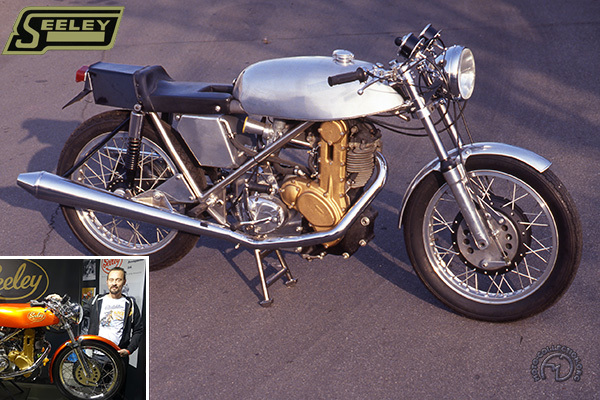 However, in 1966, Seeley began building complete bikes and acquired the production rights of the engines, giving them an extraordinary frame of his own design. The trellis girder frame was made from Reynolds 531 tubes. The Condor was the last Seeley built using this base. This fabulous café-racer was the seventh and last Condor built by Colin Seeley.